The very kind folks at ArtResin sent me a sample kit a while back to test and review. Although I had a few issues with this product, overall I was still quite pleased and will need to work with it a bit more to get the issues worked out. 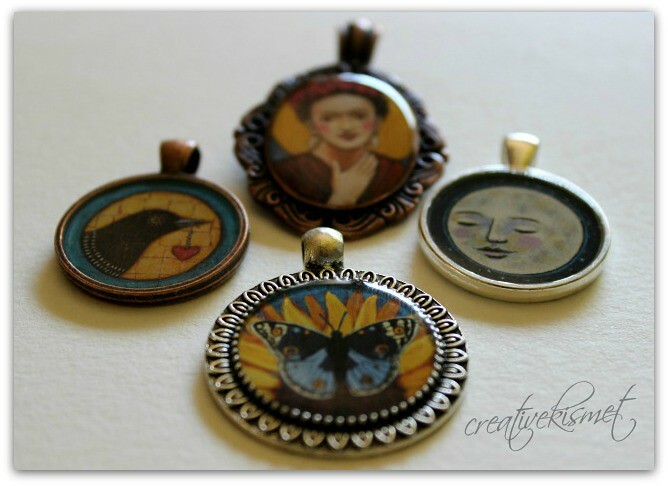 I had previously been using IceResin for my art pendant jewelry. 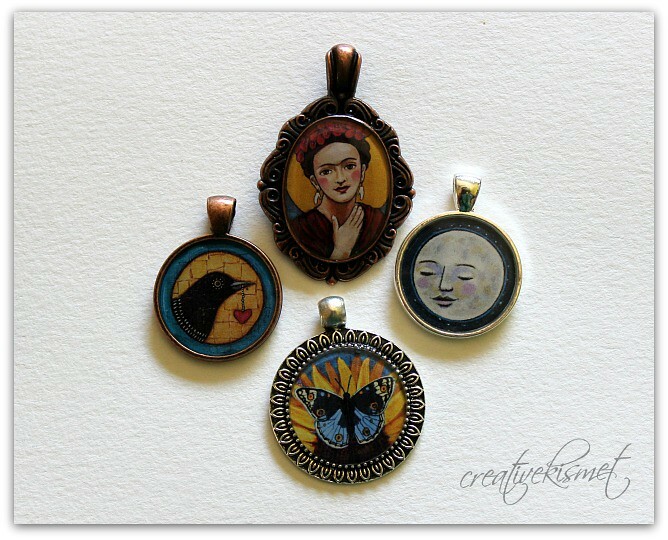 These pendants are fairly popular at my art shows and I like making little wearable tokens of my art. I have tried Diamond Glaze and glass inserts, and they always ended up yellowing and bubbling and are not permanent. Not good! I felt a resin technique would make them more durable and more significant. I was excited to try ArtResin because of having issues with Ice Resin bleeding into the paper, making it look stained in spots and sometimes around the edges. Unfortunately, this one does the same. I have tried many methods too. I have used tape ( I don’t like how it makes the image look grainy), several different sealers (Mod Podge, Collage Pauge, pva glue) and I even bought the special SLK Paper Sealer. I sealed the front and back and plus a couple more coats just for fun. Some would turn out and some didn’t — a total crap shoot. And let me tell you, a wasted pendant is wasted money. Not good for the business finances. With the ArtResin, I was able to, at least, save these pendant trays. I scraped out the resin, wiped them with alcohol pads and soaked them in water to soften the paper image and scrape it out. 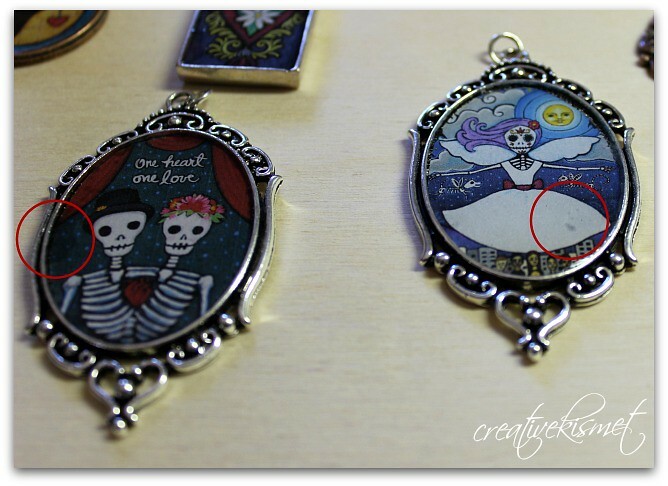 Then I cleaned them again with alcohol and the pendants are good to go for another attempt. I hadn’t been able to do this before without ruining the pendant and it remaining sticky to the touch. So, there is hope. * 30 minute work window and 8 hour drying time. * Bubbles pop easily enough, but still felt compelled to use a heat gun for safe measure. * Cost effective – only $1.54 per ounce plus free US shipping. * Paper images bleed if not properly sealed. * Only available in 16oz bottles, which is great for large projects, but 8oz would be nice for smaller projects. I will definitely be buying ArtResin for future projects. I know there is a way to stop the paper images from bleeding, I just need to figure it out! Please help if you know of a great, magical secret! I would LOVE to hear it! This entry was posted in Art, i make stuff, jewelry. Bookmark the permalink. * Use glossy paper if possible (it encourages resin to sit on top rather than soak in). * Use a product called Print Shield, made by Premier. This is a spray that seals in the paper to prevent saturation. I know you said you’d tried sealants before… this brand works! I have used very gloss paper, but the print is saturated and there appeared many tiny bubbles. The ArtResin is providing many solutions that sometimes works some times not. I also used Premier Art Print Shield and it is not prevent my artwork from bubbles. And it is because that the ArtResin epoxy sometimes fresh and new and sometimes it is old. They are not mentioning the expiration date on the product in order to sell it as is. I don,t recommend it. Do not wast your money. This original post was written in 2015 – since then, I’ve been using the Print Shield (same can for the last 3 years!) and have absolutely NO problems with ArtResin. In fact, I highly recommend it to anyone who asks.